Blending real-time strategy with card-battling, it's a prime example of free-to-play done right. I’ve played a lot of free-to-play mobile games in my time, not only during the lifespan of this column but also in the years prior, and I honestly can’t recall a game that has completely enraptured me quite like Clash Royale. Truth be told, I didn’t believe the hype around it and I got blindsided. During my first week and a half with the game, I logged more than 100 victories—and that didn’t account for my losses (thankfully less than the wins) and all the time I spent unlocking chests, upgrading cards, playing with my deck, and interacting with my clan. True, the few-minute matches are short, and playing this one-on-one strategy game for 15 minutes at a time isn’t too crazy. However, when you’re logging 15 minute sessions every hour or two throughout the day, Clash Royale’s power as an incredible time sink can’t be denied. But is there ongoing fun here without ample spending to match? When you have enough elixir charged up to unleash a card, simply drop it onto the screen and watch the creature or attack do its thing. Clash Royale is set in the same universe as Supercell’s wildly popular Clash of Clans, but this isn’t a base-building game and you don’t need to know the franchise to enjoy it. 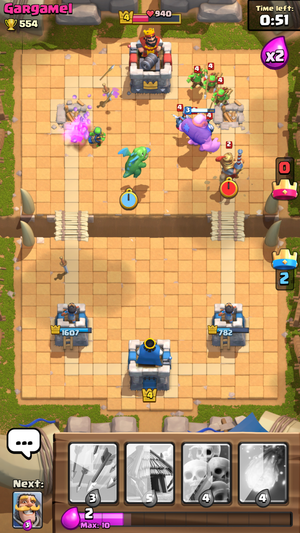 Instead, Clash Royale is a head-to-head strategy game with live, real-time multiplayer action, pitting your heroes and attacks against those of an online opponent. Your goal: Take down the opposing towers before time is up—or before your own get smashed up. In practice, it feels a bit like a one-player MOBA (multiplayer online battle arena) game like League of Legends, or Vainglory for the iOS faithful. But here, that tower-toppling design is made all the more alluring with the introduction of collectible card game elements, as all of your units come in the form of digital cards that can be placed into your deck. Cards are added to your hand randomly during battle, and you’ll have to decide when and where to place them, and whether it’s worth the elixir you’ll spend. Choose wisely: you’ve only got eight card slots, and building an effective deck that suits your play style can take a lot of trial and error. The game is impressively streamlined in battle: The mechanics are as straightforward as dragging and dropping a card and then watching the action unfold. Where the immense strategy comes in is with timing, card selection, and deck building. Ideally, you want to build a deck that gives you plenty of offensive options while letting you protect your home, but there’s a lot of variety in the 54 cards available thus far, and assembling a cohesive deck takes a lot of trial and error. In other words, experimentation and losing. Supercell’s concoction here is mesmerizing. It’s more appealing than a MOBA on mobile because the matches are short and playable with one hand, yet there’s considerable depth. And it’s more exciting than most card games because the cards power the strategic combat. It’s complex and interesting at its core, yet extremely easy to learn and understand. Honestly, there’s little to knock Clash Royale about on the gameplay side—but it is a freemium game. 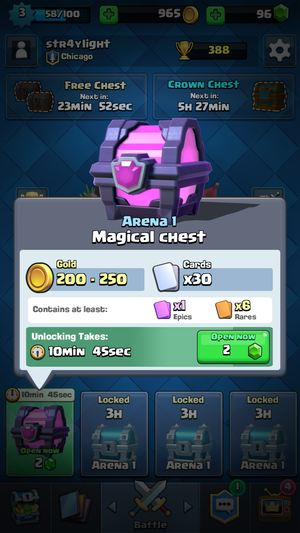 You’ll consistently get new cards and currency via chests, but they take time to unlock—and you don’t earn any more when your four slots are filled. And what makes it an especially brilliant freemium game is the total lack of play restrictions. There’s no energy meter, no lives to earn, and no artificial barriers along the way: You can play for hours and hours at a time without spending money. Better yet, Clash Royale keeps giving and giving: You’ll earn generous free treasure chests every few hours with new cards, coins, and gems. Each win earns you another chest, and every single day you can unlock a special Crown chest with loads of loot by stringing together a few wins. Actually, Clash Royale does have one limit, and it’s a creatively devious one: You can only hold onto four chests at a time, and each takes at least three hours of real-life time to unlock. At first, it made me want to stop playing when I had too many chests, as I didn’t want to earn nothing for a win. But within a few days, I stopped caring, as I just wanted to keep playing and playing. Select cards are available for purchase each day, and it can be tempting to spend a little cash to grab coins and snag a rare or epic card. I’m always wary of a free-to-play model used for multiplayer games, because the appeal tends to evaporate when you realize that big spenders can pay for competitive advantages. However, MOBA games have had a lot of success with overcoming that problem—Vainglory in particular does a great job and is highly recommended—and Clash Royale thankfully doesn’t come off as a pay-to-win experience. But you can pay for advantages. While Clash Royale is generous with its freebies and you can fully enjoy the game without spending a cent, it also dangles greater possibilities in your face. Every day, there are new cards that you can buy outright, whether you’re grabbing a rare or epic card for the first time or buying duplicates used to upgrade each card’s capabilities. You can buy expensive treasure chests, as well, with stacks of gems that would take you months or maybe years to amass through normal play. The advantage of an upgraded card is so gradual that it doesn’t register as making the game feel lopsided towards spenders. You still need to be able to build a killer deck, and you still need to know how to best use it in the heat of battle. 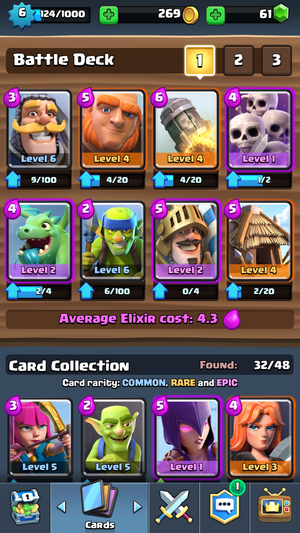 But you can definitely pour a lot of money into Clash Royale to boost your cards, snag stellar rares, and help level up your player profile with each new upgrade (which in turn makes your towers more powerful). 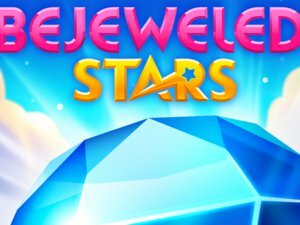 Gems are the only currency sold for real cash, and you can grab bundles that range from 80 gems for $1 to 14,000 gems for $100—and then those can be traded for coins, as well. I spent $10 on a Bucket of Gems (1,200 gems), and used those to buy several individual cards, upgrade a few others, and purchase a Magical Chest (500 gems). I also sped up several chest timers along the way. 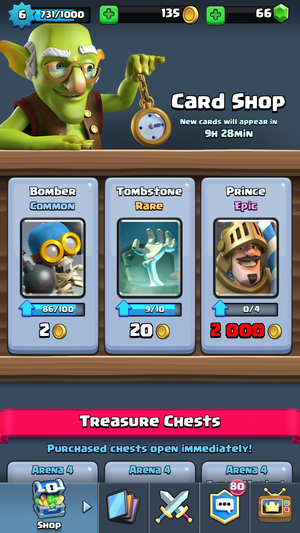 Ultimately, I spent that $10 worth of gems in about two days, tops—so you can see how Clash Royale might drain your wallet if you’re constantly in search of new and more powerful cards. I’m not likely to spend a lot more here as I typically enjoy the gradual nature of playing a freemium game without spending, but there is real benefit to having immediate access to more cards, and advanced cards too. This honeymoon period of obsessive play could go on for a while, and admittedly, I’m not opposed to fueling that addiction here and there with a quick infusion of cash. Supercell made one hell of a free game, and they deserve all of the accolades and cash that come their way: Clash Royale is a strong, smart strategy game that is perfectly enjoyable without pumping in cash, even if there’s always that subtle, nagging feeling that spending money is imperative.